Bromeliads indoors, bromeliads in trees, bromeliads in the garden  your guide to growing these stunning plants. Many people are surprised to learn that pineapples are bromeliads and, although pineapples are attractive, we all know that they are cultivated for their good taste, not their good looks. Fortunately, there are plenty of other ornamental bromeliads that are decorative in the garden: in total more than a thousand species. Some of the most popular are the Neoregelias, with their colourful central bracts, the Guzmanias with stunning flowers, the nodding Billbergias, and the curious old man's beard or Spanish moss (Tillandsia usneoides) that hangs in festoons from trees. Bromeliads are happiest in frost-free gardens in the light shade of trees. In cold areas most species can successfully be grown in well-lit spots indoors. Choose a bright position that's not too far from a window. Keep the plants away from draughts and make sure there's plenty of moisture around them. This means spraying regularly with a light mist and keeping central wells topped up with water. 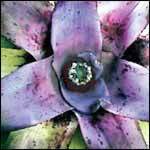 Many bromeliads are epiphytic, which means they grow naturally up in trees. In warmer climates they can be grown this way in the garden to create very striking effects. However, it may be better for the tree if bromeliad plants are attached to some sort of backing board rather than to the tree itself. Try making an artificial bromeliad support 'log' by forming a cylinder from mesh and packing it with sphagnum moss or bark. Because bromeliads have relatively small root systems, they prefer being crowded in containers. Use a well-drained potting mix (Yates Orchid Mix is ideal) and feed gently with some Nutricote controlled release pellets. Bromeliads can be grown in garden beds, but to achieve success it's important to take all of their needs into consideration. Light shade, extra-good drainage, a moist atmosphere and warmth are all important. The easiest way to feed 'broms' is with a liquid orchid fertiliser. Yates Thrive Concentrate Orchid Food can be diluted with water and applied regularly during the plants' growing season. After flowering, most bromeliads produce pups. The central 'mother' part of the plant dies and smaller plants (commonly called pups) grow around it. Pups can be removed and replanted when they are about one third the size of their mother.